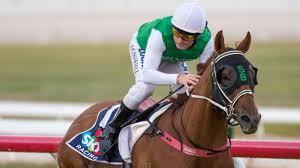 CHAMPION Tasmanian sprinter-miler Hellova Street became an equine millionaire when he delivered another stellar performance to win his third weight-for-age Mowbray Stakes (1600m) in Launceston on Wednesday. The Scott Brunton-trained eight-year-old was about $2000 short of earning a $1 million so he only needed to finish to achieve the milestone but the gelding is a born winner and showed why it has been Tasmania’s best galloper for the past two seasons. With Jason Maskiell aboard, Hellova Street ($1.28) showed good speed to lead but he was kept company by Overplay that was content to race at his girth while the well-backed Chamois Road trained tie leader to the home turn. But when Maskiell asked the gelding to lift he grabbed the bit and forged clear and went on to defeat the fast-finishing Zatacla ($21) by a length with Kenjorwood a game third and only a half-length astern. “Our aim was to give the horse the chance to win $1 million in prizemoney and we’ve achieved that goal but he hasn’t finished yet,” Brunton said. “The horse has taken us on a hell of a ride and he has meant so much to the stable and to my career. Hellova Street has notched 18 wins and 19 minor placings from 45 starts for $1.058 million in stakes.